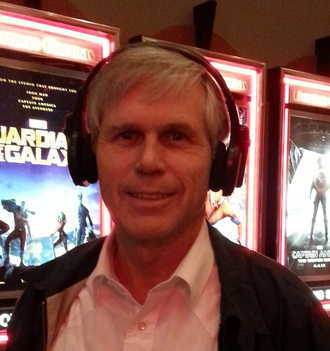 At most movie theaters, you can get a headset that is intended for those how are hard of hearing. With the sound right in your ear, you can block out the popcorn crunching. 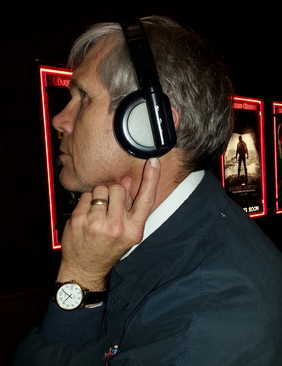 These headphones are available at the Livermore 13 theater in Livermore, California. The second picture shows me adjusting the volume control. There is no charge for using the headphones. You just leave an ID and they turn on the transmitter in the theater you are in. I have heard that some theaters have units that have plug in headphones. In those, you can bring your own headphones and plug them into the transmitter. I know that my church also has receivers for those who need more volume. Again, you can use the transmitter and headphones (especially noise cancelling ear buds) so you hear the speaker, but not the sniffer behind you.